At the age of fifty, when most people start planning for retirement, Dr. Prathap Chandra Reddy decided that he was going to revolutionize healthcare in India. In 1983, the renowned cardiologist launched the country's first professionally run private sector hospital system. Thirty years later, Apollo Hospitals has become one of the world's largest providers of high-technology healthcare. In the areas of heart, liver and bone marrow transplants, as also in knee and hip replacement surgery and robotic surgery, Apollo is an industry pioneer and a world leader. More than 32 million men and women have been treated at Apollo's fifty hospitals, which are staffed by over 70,000 professionals. How did Prathap Chandra Reddy, who grew up in the small village of Aragonda in Andhra Pradesh, actualize his dream? How did he overcome the seemingly insurmountable odds and transform the sustainable development space? How did he become one of India's enduring icons? 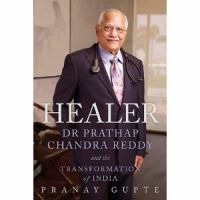 Full of delightful anecdotes and dramatic twists and turns, The Healer tells Dr Reddy's inspirational story like it has never been told before. Born in Mumbai, Pranay Gupte was educated at Brandeis and Columbia Universities. He worked for the New York Times as a staff reporter and as a foreign correspondent in Africa, the Middle East and Asia, he was a columnist for Newsweek and contributed to Forbes and other major international publications. The author of several books, he has also produced documentaries for public television and published The Earth Times, an environmental newspaper. He divides his time between New Delhi and New York.